‘We at Costa Rican Vacations set out to find the best Casado in Costa Rica! What’s a Casado you ask? A Casado is a traditional Costa Rican lunch named for the “married men” it traditionally fed. Casados will normally include rice and beans, along with a side of salad, a stewed vegetable (picadillo), fried plantains, and a main accompaniment of meat: usually fish, chicken, pork, or beef. Adam Baker has begun looking around Costa Rica to find the best spots to eat a traditional Costa Rican lunch! 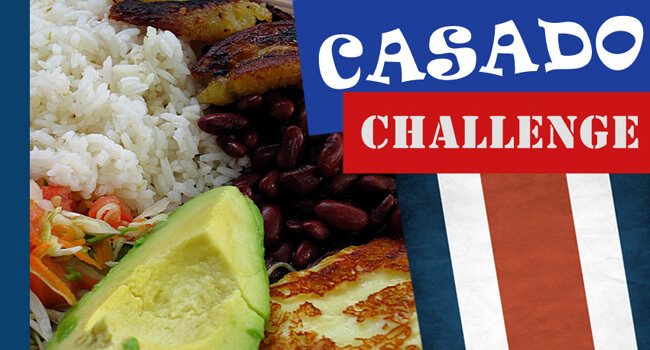 We encourage you to submit your own Casado Challenge videos to help us find the very best Costa Rica Casado. Don’t forget to mark your Casado out of 10 on 3 key elements: Presentation, Diversity and Taste. This is our scale so lets get searching! Our very first location: Mauros in San Jose. A great start with 24/30 and very cheap as well! A popular spot for visitors in Manuel Antonio: Barba Roja gets 22/30 Not bad! A very popular spot with the locals in Jaco: Chinita Pacific gets 21/30 Nice! Adam Baker checked out Kura Design Villas’ Casado on his last visit – it got a high 24/30 Great! Adam Baker headed up to his old home away from home town of Monteverde to find a top Casado!